One of 2016's surprise critical and commercial hits, 10 Cloverfield Lane is the sort-of-sequel to 2008 monster movie smash Cloverfield. However whereas that movie used the found footage approach to place the audience at ground zero during a terrifying Manhattan monster invasion, 10 Cloverfield Lane occupies an entirely different aesthetic. It's the story of Michelle (Mary Elizabeth Winstead) who, having broken up with her boyfriend, hits the road and is soon involved in a horrendous car crash. Waking up in an underground bunker with no knowledge of how she got there, Michelle is then informed by its mysterious creator Howard (John Goodman) that he has in fact saved her from a devastating chemical attack that has obliterated the outside world. But is he telling the truth? As she acclimatises to her new surroundings, Michelle must decide whether Howard and the bunker's other occupant, the amiable Emmett (John Gallagher Jr.), can in fact be trusted. Pacily directed by Dan Trachtenberg and with strong performances from its leads, there's no denying that 10 Cloverfield Lane is superior popcorn entertainment, its expert application of tension perhaps slightly undermined by a more fantastical third act that awkwardly tries to dovetail with the earlier movie. (The film did in fact start life as a completely different project entirely before the Cloverfield branding was applied to it.) One of the movie's strongest strengths is its creepy and classy score by Bear McCreary, already an established force in TV with the likes of The Walking Dead and Battlestar Galactica, but whose accomplished orchestral touch really deserves more prestigious movie assignments; the likes of direct to video sequels like Wrong Turn 2, plus this year's The Boy and The Forest, really don't deserve his thematic and innovative approach. Thankfully that all changes with 10 Cloverfield Lane, a perfect meshing of superior material and talented composer. Devoid of the murky orchestral/electronic approach that mars far too many contemporary thriller scores, McCreary instead throws back to the master of such things, Bernard Herrmann, and conjures a brooding score that keeps the listener on tenterhoks throughout. It all revolves around the swirling central theme introducing in opening track 'Michelle': steadily and implacably building to a sense of impending catastrophe, its sleek and robust nature will likely prove a refreshing jolt for those deriding a lack of innovation in contemporary genre scoring. One of the score's great strengths is its relatively lengthy track times: the menacing 'The Concrete Cell' and 'Howard' are both allowed to build a sense of genuine unease that matches Michelle's utter confusion when she awakens in the bunker, the briefest glimmers of string-led compassion being subsumed under the churning orchestral textures. 'A Bright Red Flash' is subtly modulated to fall more on the side of mystery than menace, the toiling strings hinting at an elusive answer that lies just out of reach; McCreary's oscillation between the various moods keeps the score engrossing, despite its generally dark nature. The score properly explodes for the first time in 'At the Door', the composer letting rip with racing strings and squawking brass effects in the manner of Elliot Goldenthal or late-period John Williams; it's genuinely visceral music, made all the more-so by the quieter nature of the material that has led up to it. 'Two Stories' calms everything down again with its eerie and glacial nature; once again, there's a vivid sense of humanity subsumed beneath a sense of despair and tension. In 'Message from Megan' the strings appear to arrive at some form of major-key revelation, before a swift return to the darker musical mood indicates that the sense of danger is still present. 'Hazmat Suit' takes the score in new directions, excitingly utilising Craig Huxley's famous blaster beam instrument (used by Jerry Goldsmith in Star Trek: The Motion Picture) alongside a host of staccato strings and a driving percussive undercurrent to create a sense of decisive purpose, as Michelle plans to escape the bunker. That McCreary is able to work his rhythms around the ever-present nature of the main theme demonstrates how malleable his constructs are, and how he resists turning his music into meandering, atmospheric noise. 'A Happy Family' is symptomatic of the score's design, beginning with the merest glimmer of optimism before tension and paranoia steadily takes over, building to an explosive climax. It's music that's ideally tailored to the film's narrative. 'The Burn' is another hugely accomplished piece of action/suspense writing, unforgivably building over the course of 6 minutes with its slicing strings and escalating sense of terror; in spite of McCreary's brutally modernistic textures (also calling to mind the likes of Marco Beltrami), the unerringly orchestral nature of his writing means, ironically enough, that it carries something of an old-fashioned feel. When Michelle's theme is dynamically interwoven into the musical carnage it becomes ever more exciting, the perfect distillation of her resourcefulness and desire to survive. 'Up Above' ventures even further into horror territory, the orchestra being pushed to their limits as unsettling acoustic ambience and jarring piano chords approximate the sound of something alien and monstrous; once again, the string section appears to be on the threshold of musical discovery. However, it's undercut by another plunge into thrilling action material with 'Valencia', the fiercely complex string writing some of the finest heard in a score this year. The closing statement of Michelle's theme then reaches its forthright and cathartic conclusion in 'The New Michelle' and '10 Cloverfield Lane' (the latter also reprising the blaster beam effects): by the end of the score the main theme has transformed into a defiant statement of intent that signals our central character is not the same person she was. By the end, we really do feel like McCreary has taken us on a journey with her. 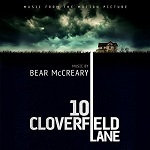 Although there's no denying that the 10 Cloverfield Lane score is often a challenge to listen to thanks to its near-relentless nature, what it also demonstrates is that McCreary is one of our finest modern-day musical storytellers. By building on the aggressive textures so popular in The Walking Dead and fusing them with the kind of richly thematic approach so sorely lacking in 21st century thriller scores, McCreary has come up with one of the year's greatest surprises. Give this man a blockbuster movie, right now. The soundtrack album for "10 Cloverfield Lane" is available in CD and MP3 formats from Amazon.com and Amazon.co.uk.